Opening weekend $67,418 million on 2 screens. Nominated for Best Actor-Sean Penn. Of all possible populations of people, I can think of few that seem more poorly represented in film than the mentally disabled. Maybe really short people get fewer accurate portrayals, but otherwise, I’m hard-pressed to conjure another group that so consistently fails to appear in a realistic manner. That’s because Hollywood’s in love with the idea of the magical mentally retarded. Almost invariably, when we see someone with a mental disability, they’re pure, sweet and inherently seen as better than those with normal IQs. There’s always a lesson for the smart people to learn from these slower folk, as the latter attain a virtually mystical aura. Rubbish! Like all sorts of people, there are lovely mentally handicapped people and there are nasty mentally handicapped people. Having a low IQ doesn’t automatically make one Gandhi. But in the course of insultingly patronizing movies like I Am Sam, however, we’re led to believe in the virtual superiority of the slow-witted. 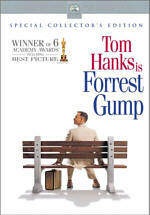 It’s absurd, but through flicks like this and Forrest Gump, we see it again and again. Left on his own, Sam tries to take care of baby Lucy to the best of his abilities, and things actually go quite well for the first few years. He gets some help from friends; agoraphobic neighbor Annie (Dianne Wiest) assists nicely, and Lucy grows up to be a sweet and smart little girl. Repeatedly through the film, we’re told that Sam functions on the same level as a seven-year-old. This sets the ticking time bomb in motion as many folks start to fret: how will he take care of Lucy (Dakota Fanning) when she turns eight??? Lucy starts to act dumber than she is because she doesn’t want to surpass her dad’s abilities. School personnel pick up on this and Child and Family Services (CFS) becomes involved. After a modestly negative incident at Lucy’s birthday party, they take her from his custody and put her in foster care. From there Sam becomes a legal drama. Sam approaches shark lawyer Rita Harrison (Michelle Pfeiffer) to handle his case. Not exactly the compassionate sort, she immediately tries to get rid of him, but eventually her chronic lying catches up with her; in front of colleagues, she claims she’s working on the case pro bono, so this requires her to actually do so to save face. Perhaps the ultimate “Type A” personality, Rita and Sam present totally opposite characters, but they learn to work together to press his case. Where do I start? I Am Sam isn’t your average, everyday bad movie. It takes terrible films to a totally different level. 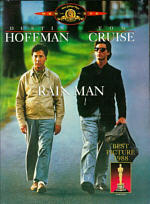 I’ve disliked flicks of this sort in the past; God knows I let loose much bile toward Rain Man. However, Sam is so manipulative and absurd that it makes Rain Man look like the model of cinematic restraint. Sam offers a ridiculously contrived and phony tale, factors that are exacerbated by its inane attempts to seem “genuine”. Virtually the whole film’s shot with hand-held cameras in a pathetic attempt to give it a documentary look. However, it also used radically stylized colors to make its points. Whenever we see Sam and Lucy interact happily, the hues look all warm and fuzzy, but as soon as we enter the courtroom or other official domain, things become viciously cold and clinical. Clearly director Jessie Nelson thought too much when she took film classes. She tried to take every easy technique to make her points and packed them all into this flick. All this served to do was bludgeon the viewer over the head with her points, as the film totally lacked any sign of subtlety. That extended to the acting. How in the world did Sean Penn get an Oscar nod for his work here? Basically, all he did was emulate Dustin Hoffman’s turn in Rain Man; there’s virtually nothing else to his work. I’ve liked Penn for years, but he brought no sense of realism to the role. As for Pfeiffer, I initially enjoyed her overamped antics as an aggressive lawyer. She played the role in a very cartoony vision of the “Type A” personality, but it offered a fun departure for her. However, I knew those came with a price, as she eventually would drop her defenses and become a warmer, more likable person. At that point, her performance ceased to seem entertaining. She managed to appear provocative at first simply because of her excesses, but that was all. Could Sam possibly have telegraphed its points more heavily? This movie clearly believes in a world of absolutes. It didn’t help that they used an almost impossibly angelic-looking kid for Lucy. Dakota Fanning seems like she comes from the Jon-Benet world of talent, as she usually comes across like she’s 30. This reaches its most excessive level during her courtroom deposition, when she talks and acts just like a middle-aged screenwriter; there’s absolutely no sense of realism to the character. Since Sam, Lucy and their cohorts come across as almost totally good, that meant those on the other side of the coin need to be evil. Sam delivers that portrayal, as we see many wicked lawyers, social workers and teachers, all of whom clearly salivate over the notion that they’ll be able to take Lucy from Sam. Absurd! I work in the field, so I know exactly how hard it is to get social workers to do anything. Kids can be in clearly problematic situations, but it takes severe issues for anyone to remove them from those places. The concept that they’d swoop in and steal away Lucy for so little reason seems absolutely ridiculous. I know of cases in which inept mentally retarded parents care for severely mentally retarded kids, and it would clearly be best if the child went elsewhere. However, that’s extremely difficult to make happen. I won’t say it’s impossible for the events of Sam to occur, but based on my experience, it seems extremely improbable. I could go on about this disaster for hours, but I’ll end my discussion now before I blow a gasket. I Am Sam provides one of the most manipulative films I’ve ever seen; I expected to see Leni Riefenstahl’s name attached to it. It takes serious issues and treats them in such an obvious and patronizing way that it makes most TV movies look thoughtful and well balanced by comparison. It even provided an ending that seemed stupidly neat and tidy. From the thin and stereotypical characters to the ridiculously contrived and forced situations to the heavy-handed filmmaking techniques, Sam fails on virtually all fronts. 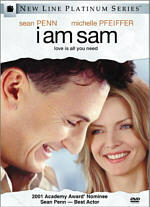 I Am Sam appears in an aspect ratio of approximately 1.85:1 on this single-sided, double-layered DVD; the image has been enhanced for 16X9 televisions. Though generally solid, the picture of Sam fell just short of “A” territory. Sharpness usually appeared positive. Most of the movie remained nicely crisp and well defined, but a few wider shots showed mild signs of softness. Nonetheless, these were infrequent, as the film seemed distinct and accurate most of the time. I saw no signs of jagged edges or moiré effects, but I did discern some light edge enhancement on occasion. As for print flaws, most of them seemed absent, but some interiors appeared moderately grainy. Sam used colors in a very heavy-handed way, and that affected their presentation on the DVD. The various hues seemed unnatural, but this was clearly intentional on the part of the filmmakers. In any case, the tones remained clear and appropriately saturated throughout the film, at least within the constraints of the production design. Black levels came across as nicely deep and dense, while shadow detail was accurate and not too thick. In the end I Am Sam offered a picture that seemed satisfying. Also good but unexceptional were the soundtracks of I Am Sam. The DVD offered both Dolby Digital 5.1 and DTS 5.1 mixes, and I was hard pressed to hear much different between the two. I felt the DTS edition provided slightly stronger bass response, but this was a marginal improvement. Overall, the two tracks seemed identical to me. As one might expect from this sort of character drama, the soundfield maintained a fairly heavy bias toward the front channels. Music dominated the audio. I heard very solid stereo imaging in the front that displayed the songs and score at their best. Effects tended toward general ambience, as we got very little in that realm other than environmental material. However, that isn’t a complaint, for such usage made sense for the film. The surrounds remained pretty passive throughout the movie. They largely offered reinforcement of the effects and music, though they occasionally became a little more active in regard to the score. For example, in some scenes when Sam would spin, the music would whirl about us nicely. Nonetheless, this was a very front-oriented mix. Audio quality appeared fine. Dialogue always seemed natural and distinct, and I heard no concerns related to intelligibility or edginess. Though they remained in the background, effects sounded clean and accurate; they made little impact in a positive way, but they also failed to be a negative distraction. Music shined throughout the movie, as the score and songs provided bright and vivid audio. Bass response appeared tight and deep, and the other dynamics of the track seemed strong. Ultimately, the soundtracks of I Am Sam won’t dazzle anyone, but they worked well for the material. Although New Line didn’t totally pack the DVD release of I Am Sam, it still included a nice mix of materials. First up we get an audio commentary from co-writer/director Jessie Nelson, who offered a running, screen-specific track. At times, Nelson provided some reasonably good remarks about the production, especially when it came to her work with the actual disabled actors seen in the film. Many of her technical statements seemed to reveal the obvious, though, such as when she discussed the various color schemes and the camerawork. In addition, she spent way too much of her time praising the actors. It seemed like half the commentary consisted of little more than remarks like “I love Sean’s choice there”. At least Nelson showed a low-key but acceptably engaging presence, which made the track more entertaining. Overall, fans of the film might like the commentary, but others will probably feel fairly bored with it. Next we find an original documentary called Becoming Sam. This 42-minute and 30-second program provides the usual mix of film clips, shots from the set, and interviews with participants. In the latter domain, we hear from director Nelson, co-writer Kristine Johnson, producers Edward Zwick, Marshall Herskovitz, and Richard Solomon, costume designer Susie DeSanto, director of photography Elliot Davis, editor Richard Chew, musicians Ben Harper, Rufus Wainwright, Aimee Mann and Michael Penn, and actors Sean Penn, Michelle Pfeiffer, Dakota Fanning, Laura Dern, Richard Schiff, Stanley DeSantis, Doug Hutchison, Joseph Rosenberg, and Brad Allan Silverman. After this we locate seven Deleted/Alternate Scenes. These run between 40 seconds and three minutes, 50 seconds for a total of 11 minutes and five seconds of material. The first six are actual unused sequences, while the final one offers some “Unexpected Moments”, which means outtakes. However, they’re not the usual goofs; instead, they feature some improv moments for the most part. The scenes found here greatly resemble those seen in the film. They’re neither better nor worse than the stuff in the final film, though one bit in which Sam goes off at a Starbucks customer is hilariously bad. The clips can be viewed with or without commentary from Nelson. Her remarks continue the same gooey tone heard in her main track, and she speaks only intermittently. For the most part, she tells us why the scenes didn’t make the film, though she neglects to make that point for some of the pieces. Annoyingly, the deleted scenes don’t provide a “play all” option, so each must be accessed manually. However, all of the video extras are shown with anamorphic enhancement, and the deleted scenes and the trailer also feature Dolby Digital 5.1 sound. Though they include no subtitles, the documentary and the deleted scenes do include closed-captions. In addition to the film’s theatrical trailer, we discover the theatrical press kit. This splits into three smaller domains, all of which offer text. “About the Production” includes some fairly substantial comments about the making of the flick. After the commentary and the documentary, a lot of the material will seem familiar by now, but that doesn’t negate the fact this is a good collection of notes. The remaining two areas provide biographies of participants. In “About the Cast”, we get listings for actors Penn, Pfeiffer, Fanning, Dianne Wiest, Hutchison, DeSantis, Silverman, Rosenberg, Schiff, and Dern. “About the Filmmakers” gives us entries for director Nelson, co-writer Johnson, producers Herskovitz, Solomon, and Zwick, executive producer David Scott Rubin, director of photography Davis, production designer Aaron Osborne, costume designer DeSanto, editor Chew, and composer John Powell. Essentially, these offer annotated filmographies. They help flesh out the various careers reasonably well, though. Lastly, we get a mix of DVD-ROM materials. “Script to Screen” lets you read the original script while you watch the movie; the video runs in a small screen on the left as the text displays on the right half of the screen. There’s also a link to the “Original Website”. Unfortunately, unlike many other New Line DVDs, this really is nothing more than a link; some of their other releases included all of the site’s information on the disc itself. The “Hot Spot” sends you to a New Line site that apparently should offer revolving pieces of information and activities. However, I don’t think this page becomes active until the DVD actually hits stores. Since I’m watching it more than a month in advance, I see nothing there currently. As I watched I Am Sam, I could scarcely believe my eyes. I didn’t think it was possible to make a film quite so condescending, artificial and unbelievable under the guise of true-life drama, but somehow this film did so. 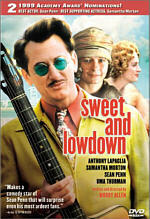 The DVD, however, offers solid picture and sound as well as a pretty positive roster of extras. Obviously I can’t recommend the DVD to anyone who doesn’t know that they like Sam. I loathed the flick and want to steer anyone who hasn’t seen it away from it. However, for those who enjoyed it, they should be very pleased with this fine release.